What used to be a tree-filled meadow. The small creek on the left is the Little Thompson River. In September 2013, four days of torrential rainfall devastated parts of Colorado’s Front Range, killing nine people and damaging or destroying around 1,800 homes. A number of roads were washed out by floodwaters, stranding thousands of people who had to be helicoptered to safety. That was the case for the people of Pinewood Springs, a small community in the Rocky Mountains between Lyons and Estes Park. On a cloudy, rainy Monday, most of the town’s roughly 600 residents found themselves walking to a field, boarding a Chinook helicopter and being taken to either Fort Collins or Boulder. Flood evacuee Kerry Grimes talks about life in Pinewood Springs five years later. Kerry Grimes and his wife Alison, along with their dog Mocha, were among those people and animals evacuated. I spoke to him by phone just a few days after that experience. 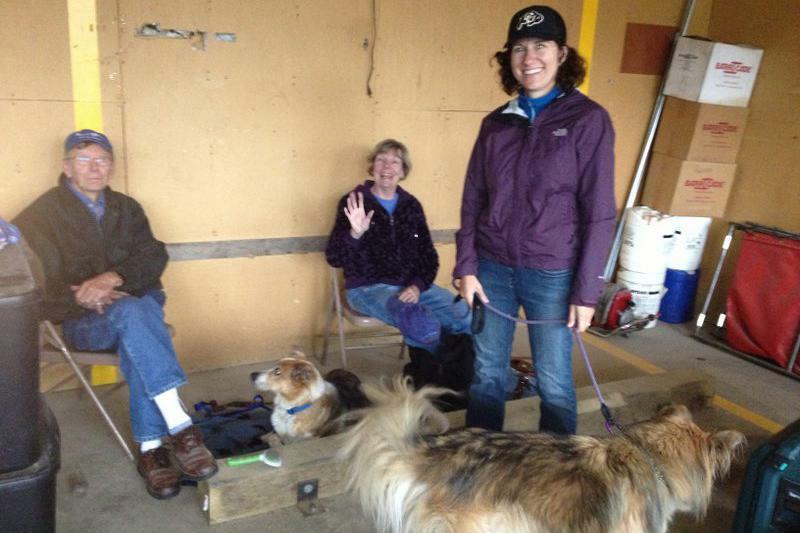 Alison Grimes and Mocha, along with several other residents, Sept. 15, 2013. Five years later, life in the town of Pinewood Springs is mostly back to normal. I met Kerry Grimes there and asked him to pick up the story of the day when they realized this wasn’t just another rainstorm. At that point he and his wife went out for one of their usual hikes and could immediately tell something was different. The Little Thompson River swelled and merged with a small lake (left). Today, both have retreated to their respective banks. “Little side streams coming down where they had never been before. The river was like an ocean, almost with waves and rocks and trees. It was kind of spooky,” he said. In Pinewood Springs, the Little Thompson River is normally not much more than a trickle. But when he and his wife Allison walked to it on that Thursday, it was a very different river – swollen and angry, dragging rocks along its path, uprooting trees, and taking out a very vital piece of infrastructure. Kiowa Road bridge was washed out by the Little Thompson in the 2013 floods; today, the bridge has been rebuilt. Residents built a trail on a nearby hillside so they could walk out or be driven out on all-terrain vehicles. Though everyone who wanted to got out safely, Grimes said that area remained washed out for weeks. Grimes credits the tight-knit community for banding together, and the independent volunteer fire department for its strong leadership during the event. At a community meeting, residents were told to prepare to be on their own and self-sufficient for several weeks. It turned out to be only five days before the helicopters arrived. Looking back, Grimes said it feels as though the disaster brought the residents of Pinewood Springs closer. Grimes said he and Alison always knew they’d come back to Pinewood Springs – it was just a question of when. Their home was relatively unscathed and they were able to return about six weeks after being evacuated. “A lot of people didn’t come back for six months, or a year – and a few didn’t even come back at all. But for us, I think it was never really a question,” he said. 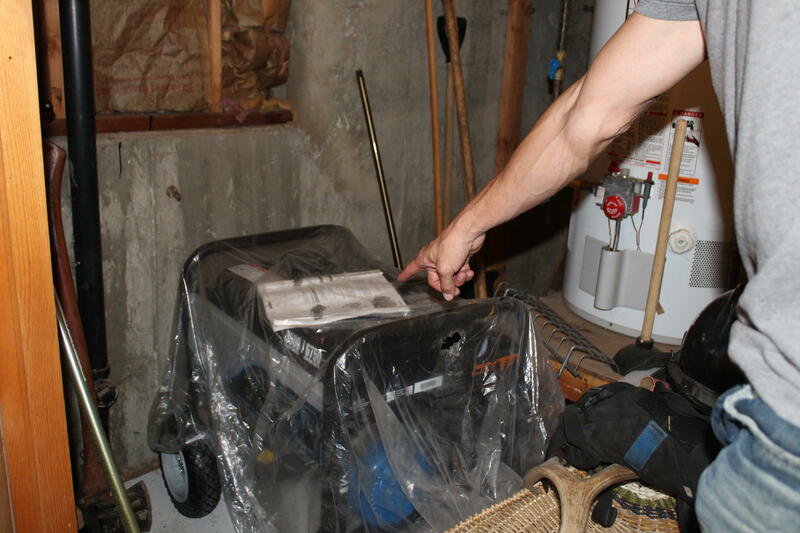 Kerry Grimes points to their new - and still unused - generator. They did implement one change he’d talked about in our phone conversation five years ago. They purchased a generator, which would have come in handy during the floods to ensure they would at least have a working refrigerator. Fortunately, he said they haven’t had to use it yet – but they’re now much more prepared, should the unthinkable happen again. Colorado’s devastating torrential floodwaters washed out countless roads and bridges, essentially stranding many mountain communities – including Pinewood Springs. The small community of about 600 residents is part of the town of Lyons but lies within southern Larimer County. Five years ago flood waters caused immense damage along Colorado’s northern Front Range and foothills, killing nine people, upending the lives of thousands of others. And just as the raging water left a lasting imprint in the minds of those who lived through it, it did the same to the land itself. During four days of rain, and weeks of receding, rivers altered course, reservoirs filled with sediment, and soil slipped down hillslopes, ending up as sand bars and log jams downstream. The change was so abrupt and sudden maps had to be redrawn. 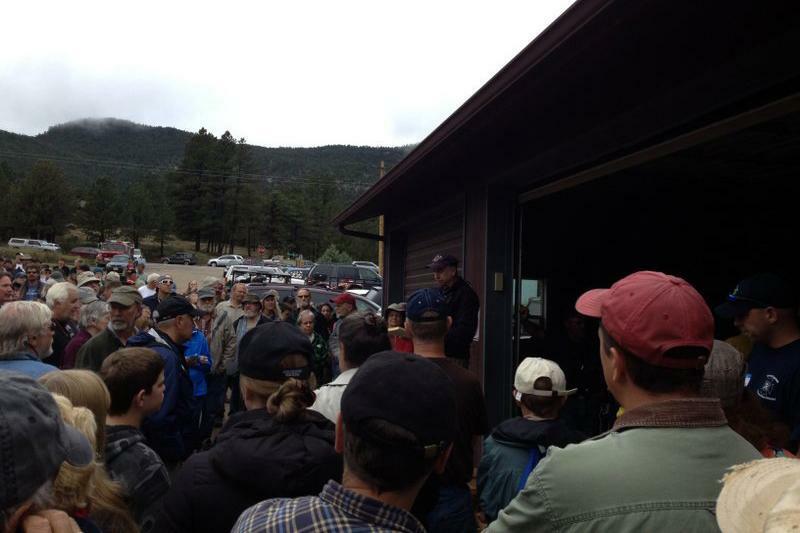 In September 2013, historic flooding fundamentally changed Jamestown, Colorado. Landslides triggered by massive rains destroyed homes, buried the town’s fire station and left one resident dead. What happened next was what some call the most ambitious recovery project in the town’s history. The effort is finally wrapping up this fall, leaving residents with a big question: Where do they go from here? A major stretch of US highway 34 through Big Thompson Canyon is set to reopen just in time for the Memorial Day holiday. The route will be accessible to the public starting May 24 at 4 p.m., said Johnny Olson, Colorado Department of Transportation regional director. “The Thursday before Memorial weekend we will be opening that up,” he said.